Erect knotweed was cultivated in ancient Iowa and may have been domesticated. It flowers and fruits throughout the summer and into the fall until a killing frost. A synchronized flowering period late in the growing season results in simultaneous ripening of a quantity of small-sized starchy seeds during October. Erect knotweed can be harvested by pulling up the plants by the roots and shaking or stripping off the fruits. 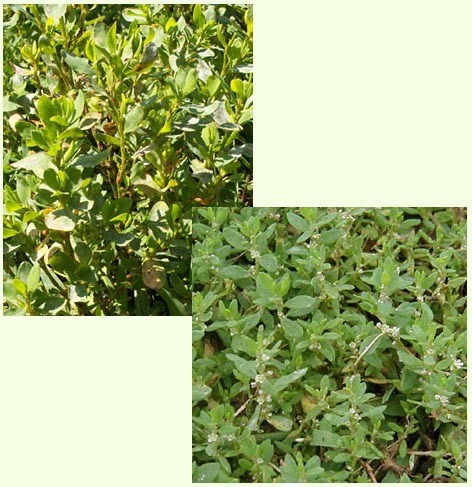 Today it grows in abundance in cattle and hog pastures and feedlots, and along dirt and gravel roads in flood plains. Archaeologists report discoveries of cultivated erect knotweed in Iowa beginning as early as the Middle Woodland, 2,000 years ago, although it is more common in Late Woodland, Great Oasis, Mill Creek, and Oneota contexts. Like goosefoot, its starchy seed could be cooked in a variety of ways. Among historic Native Americans, it also had medicinal purposes, and varieties of knotweed were used in dyes and for smoking. Although knotweed is frequently reported at Iowa sites, taxonomic difficulties and problems in identifying species exist. 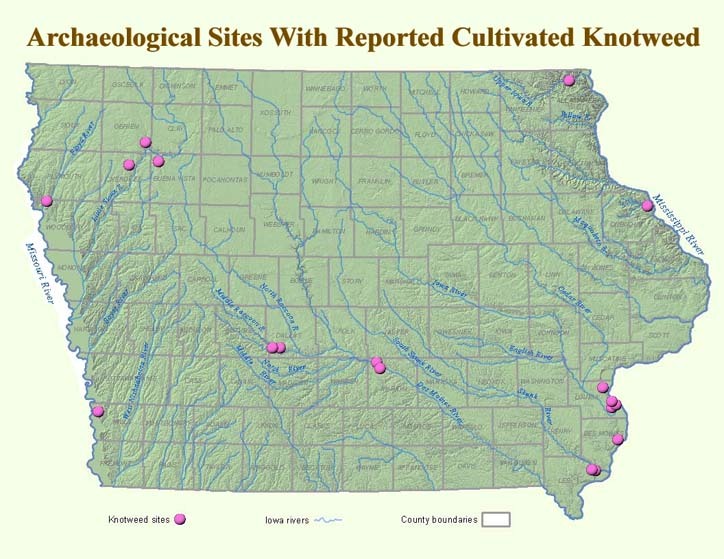 Only instances where researchers identified seeds to genus and species, or indicated the likelihood that the archaeological specimens represented cultivated forms, are listed on the table and at the site locations shown on the map.